Strawberry plants today are often started from existing plants. While growing them from seeds can be done, it is not recommended. Seeds taken from fruit will often revert to an older plant type used to develop the current strain of plants and may not produce the desired results. The life cycle includes both growth from seeds and the developing of new plants from the mother plant. The fruit of the strawberry plant, the strawberry itself, is covered with hundreds of tiny seeds. These seeds, once in the ground, will begin to sprout the following spring, however, they will not produce the same type of lush berries as they have come from. Most of today’s strawberries are specially bred to produce a certain type of berry and to be disease resistant. The seeds from these berries will produce plants that are throwbacks to earlier strawberry plant types. Today’s strawberries come from plants that are hybridized and propagated. The seed will germinate and sprout the following spring. The plant will grow beginning with spring's warming weather. It will leaf out and grow to a height of 4 to 6 inches. It may or may not produce flowers. As temperatures cool, the plant will die back until only a leaf or two and a few stems remain. During the second year, the plant will again begin to grow. It is now considered a mother plant. During this year, it will send out runners, long shoots that travel along the ground some 8 to 12 inches from the mother. Here it will set down roots, and a new daughter plant (one not grown from seed) will begin to grow. The mother plant will flower and, if pollinated, will produce its first berries. The third year follows the same pattern as the first, only this time the daughters are now mothers and begin to send out runners of their own as well as produce fruit. This is the most prolific year in the life of the original strawberry plant. Unless it receives expert care, strawberry plants generally only produce for three years. The most you can expect under ideal conditions is five years. 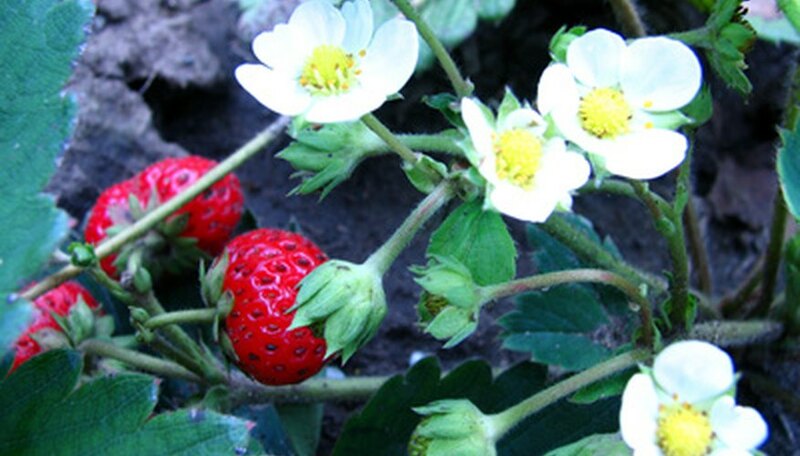 As strawberry plants age, they stop producing both flowers and then fruit. This usually occurs after the third fruiting season. Plant life can be prolonged to five years if weeding, fertilizing, watering and protection from winter’s cold have been applied properly throughout the plant’s life. Generally by the end of the fifth year, even the newer plants are no longer performing well, as the bed has been drained of its nutritive properties, and often the plants have become infected by disease or pests. At this time a new bed should be started. What Is the Difference Between June-Bearing and Everbearing Strawberries?